Bernice B. Ricke, 81, died January 11, 2019 at the Villa Care Cen­ter. Mem­orial visitation will be held from 5:00 – 7:00 p.m. Wed­nes­day, Jan­uary 16, 2019 at Gun­derson Funeral Home & Cremation Services. Memorial service will be held 11:00 a.m. Thursday at Good Shepherd Lutheran Church. Bernice B. Hollander was born on June 15, 1937 in Evanston, IL. She received her education in Glenview, Northbrook and Chicago. On Nov. 23, 1955, she married Harold G. Clavey in Waukegan, IL. He died in May 1959. She then married Dale Ricke on July 11, 1964 in Wilmette, IL. The couple returned to Iowa and lived and worked together on the family farm south of Vincent for 25 years. Together they hosted the Farm Progress Show in 1974. In April of 1989 they moved into Vincent. Besides her work on the farm she enjoyed crafting and flea marketing for many years. Survivors include her husband Dale Ricke, Vincent; sons Harold “Gary” (Alaine) Clavey of Vincent, Raymond (Janelle) Clavey of Eagle Grove, Duane (Bernadette) Ricke of Vincent, Darren Ricke of Fort Dodge; her daughter Rochelle (LaVerne) Sandvick of Polk City; numerous grandchildren and great grandchildren. 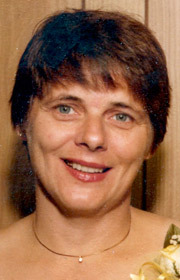 She was preceded in death by her parents Hubert H. and Irma Hollander and her brother Hubert J. Hollander in 1998. Memorials may be directed towards Good Shepherd Lutheran Church or to the discretion of the family.